← Single Card Tarot Reading – November 21, 2013. Single Card Tarot Reading – November 22, 2013. Happy Friday! The card I received today was the Six of Cups from the Universal Rider-Waite-Smith Tarot Deck and what a perfect card to kick off the weekend. 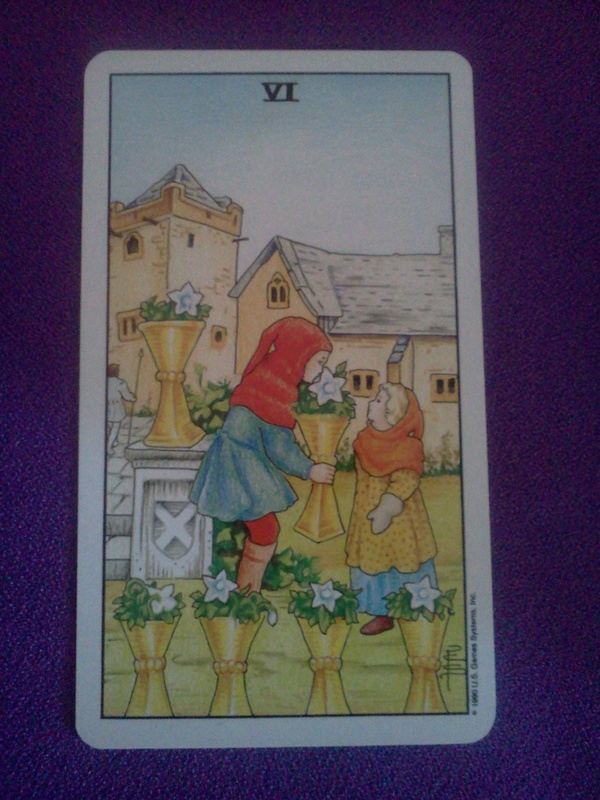 The Six of Cups encourages us to indulge in emotional abundance. Do the things that bring you joy and make you happy. If spending time with others makes your heart swell, then call up a friend or two or ten and share a pot of tea or go for lunch. The energies of this card make reconnecting with people or forming new friendships easier and more successful, so if you’ve been wanting to get to know someone better, then this is the perfect time to approach them. Another energy this card brings up is a sense of nostalgia and a desire to return to a childlike state. While living in the past is unhealthy and doesn’t allow for growth or forward progress, there can be something very healing about honoring your past and your child-self. Today you might feel like spending time reminiscing with friends or family, busting out the old photo albums or splurging on one of your favorite childhood treats. Splurge away, your inner-child needs some attention, now is the perfect time for a little regression. I will try to have another reading up for you tomorrow morning, though it may actually be later in the afternoon.